MIAMI STATION: "Floating" and "shimmering" are two of the adjectives in All Aboard Florida's description of its Miami station and commercial complex. The tracks and terminal would be 50 feet in the air. At a media event in the shadow of Miami's Government Center, AAF officials unveiled renderings of a massive 11-acre terminal and commercial district that would anchor the southern end of the rail line. Its tracks and the terminal itself would be 50 feet in the air, designers said, so surface car traffic would not be disturbed. And the whole installation would be ringed by new buildings, including an 80-story skyscraper. Most of the complex would be just east of the Government Center on land that's now a parking lot. 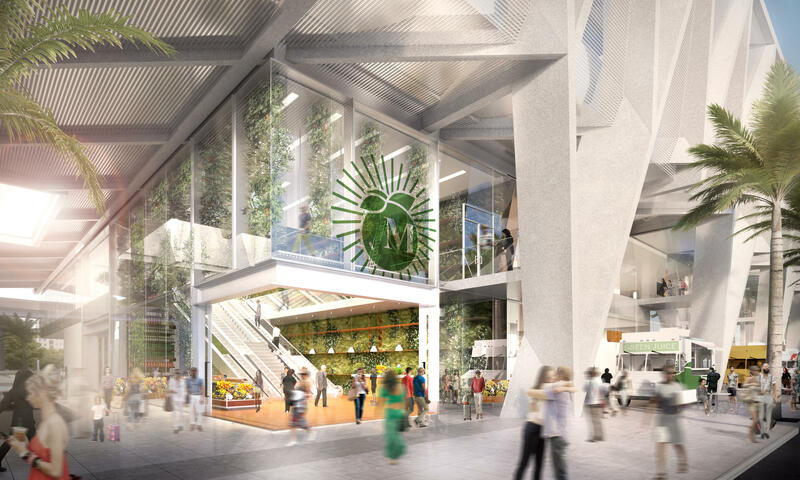 It would also include a complementary two-acre installation at the Overtown Metrorail station about 1,000 yards away. High-speed service between Miami and Orlando -- 16 trains a day -- could begin as soon as 2016, according to published projections. The company says it will be the first privately-built rail system in Florida in more than a century. Miami-Dade County Mayor Carlos Giménez said the rail line will unite the state's top two commercial and entertainment centers. "This will create a transit corridor that allows us to harness the economic impact of a region that extends from South to Central Florida," Giménez said. "In combining these two regions, we bring nearly nine million people closer together." But smaller, concentric connections will also be made, designers assured reporters and local officials: the Miami metro area with the Palm Beaches, Miami with Fort Lauderdale, and the critical locations within Miami itself. 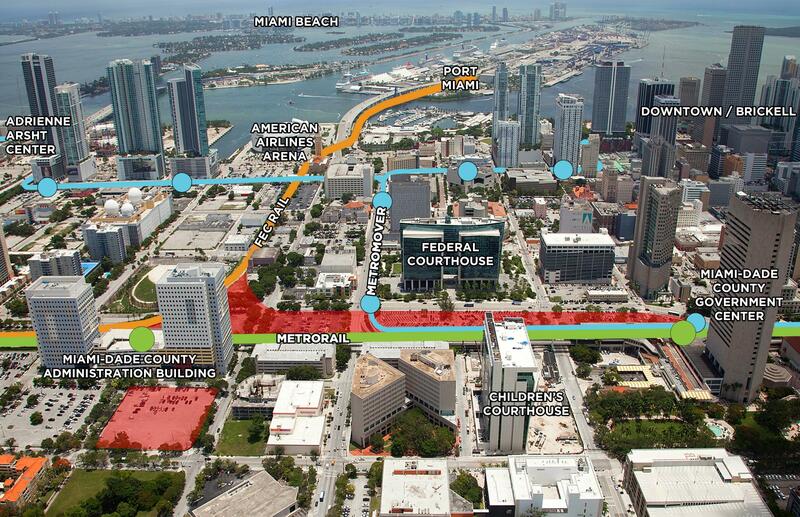 YOU ARE HERE: How the station would be situated in Miami. "Symbolically and visually, it's a great land bridge that connects the courthouse district to the emerging cultural waterfront district and Overtown district over there," said the project's chief designer, architect Roger Duffy of the worldwide firm Skidmore, Owings & Merrill. "It's a great span." Renderings give the impression of a huge, airy complex with pedestrians and motor traffic making their effortless ways past shops and restaurants, underneath gracefully floating tracks and behind an airy structural filigree that will catch the sun, in Duffy's words, "and shimmer like a sequined dress." A GREAT SPAN: Miami's All Aboard Florida station may be something like the Roman Aqueduct of Nimes but with more shopping. There were straight-faced comparisons with the Brooklyn Bridge, Grand Central Station and the Golden Gate Bridge during Wednesday's presentation. And it didn't stop with those minor landmarks. 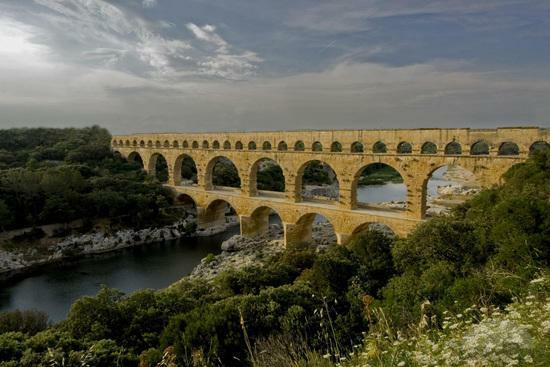 "It'll be something like the scale of the Great Aqueduct in Nimes," Duffy declared, referring to a 31-mile structure built by the Romans over France's River Gardon in the First Century A.D. The aqueduct is now a World Heritage Site. But outside of South Florida and the Orlando area, there are issues with All Aboard Florida. On its way between those metropolitan areas, the trains will barrel through several counties where the All Aboard experience may be little more than noise, traffic disruption, and maintenance costs. Thousands of residents of several counties along the tracks have signed petitions against the project. Their main concern is that the promised passenger service is only a reason to repair and upgrade tracks so that Florida East Coast Industries, which owns AAF as a subsidiary of the Fortress Investment Group, can be ready to expand its business hauling cargo from the newly expanded ports in South Florida. But even with no cargo, the AAF trains will make no stops between West Palm Beach and Orlando. Citizen activists, some of them members of a protest group called Florida NOT All Aboard, say the frequent trains will stop traffic and interfere with boating and fishing. But, in South Florida, decision makers are envisioning thousands of new jobs and an economic impact measured in billions of dollars. Residents of Overtown are imagining new opportunities, although they have heard promises before. "It can't hurt us," says businessman and Overtown activist Irby McKnight, who plans to track the progress of promise and delivery. "It does not displace anyone and that's basically our main issue. I welcome it. Now, let's see how we benefit from it."